Sunday marked the completion of the seventh edition of the 3WallBall Outdoor World Championships, with players vying to make history on the 3WallBall 3-Wall and 1-Wall courts. The Women’s 3-Wall Big Ball Singles final was anticlimactic, as Tanisha Groomes was hobbled by a knee injury suffered in the semifinals. Daskalakis took advantage of an immobile Groomes, making quick work of the WPH Outdoor #1 for her first WPH Outdoor 3-Wall singles title. With Juan Santos and Timbo Gonzalez both winning their first two divisions, the doubles final would determine the year-end number one WPH Outdoor pro. Santos teamed with Alfredo Morales and ensured that the Player’s Cup would return with him to Orange County. Santos and Morales used the lob to perfection against Gonzalez and Shorty Ruiz, dropping three lobs on the back line in the first game and keeping Team Gonzalez/Ruiz on their heels throughout the match. Santos emphatically clinched the year-end number one ranking for the fourth time in five WPH Outdoor seasons with a comprehensive victory. Sandy Ng teamed with Tracy Davis for the sixth consecutive year in the Women’s 3-Wall Big Ball doubles and made it six for six with Davis in the 2016 final, defeating Team Daskalakis/Groomes in a lopsided final. Ng has now won the 3-Wall Women’s Doubles for the seventh consecutive year with two different partners, making Ng the only handball player in the history of the 3WallBall Championships to have won a title in every edition of the event. The juniors took the stage on Sunday morning, with more than 25 youngsters battling next to their WPH Outdoor heroes. The juniors demonstrated outstanding skills and sportsmanship throughout the morning and afternoon, with many of the matches decided by three points or less. Thank you to the World Players of Handball staff, film crew, and interns, World Outdoor Racquetball, and all of the volunteers that made the 2016 3WallBall World Championships such an incredible event. Staffers, the film crew, and the volunteers worked 20-hour days throughout the event to ensure that matches were running on time, ESPN viewers were able to watch the event in the best possible coverage, and players were treated well. Stay tuned to wphlive.tv for updates throughout the week! Saturday featured the 2016 3WallBall Outdoor World Championships busiest day, as many of the competitors played 6-8 matches in four different divisions. The action was exciting and intense, as each of the game’s top stars desperately played to reach Sunday’s final rounds. Gio Vasquez faced Tywan Cook in the bottom bracket semifinal and attacked the 2012 world champion with power whips and off-the-court angles. Vasquez never allowed Cook into the match, advancing to the final with a comfortable 25-14 victory. “Gio was really warmed up from his earlier small ball game and he had a lot of power on his whips from using the small ball,” declared Gonzalez. Jenny Qu was making her first appearance at the 3WallBall Championships and wasted little time making a name for herself in the Women’s 1-Wall Big Ball singles. Qu overwhelmed current 1-Wall women’s world champion Danielle Daskalakis with a combination of power, up-the-line drives, and consistent offense. Sandy Ng had little difficulty in defeating living legend Tracy Davis, advancing to the final for the second consecutive year. Top-seeded Tywan Cook and Carlin Rosa faced Carlos Pena and Hector Velez in the upper bracket semifinal. The teams traded the lead eight times en route to a 19-all tie, with the foursome combining for some of the most spectacular handball of the event. Rosa took over in the late stages of the match, scoring three straight points on kills and closing out the match on a six-point streak. “I’m just so happy to make the final and to be playing with my good friend Carlos,” stated Velez on ESPN. Timbo Gonzalez partnered with Philadelphia’s Sam Sanford and faced current “King of the Court” Rookie Wright and Enrique “Lefty Henry” Santiago. The nearly 40-year combined age gap was evident from the start, as the early twenty-something team of Gonzalez and Sanford outplayed, overwhelmed, and demolished 1-Wall Big Ball’s best team of yesteryear in a 12-minute, 25-1 annihilation. Top seeded Team Daskalakis/Ng had little difficulty advancing to the final, outscoring their quarterfinal and semifinal opponents by a combined 50-23. Second-seeded Melissa Sky and Tamiko Pearson cruised to the final in the bottom bracket, outscoring their quarterfinal and semifinal opponents by a combined 50-25. The bottom bracket semifinal pitted Gio Vasquez against David Fink. Vasquez led 9-4 before surrendering 13 consecutive points to the lefty. With Fink leading 17-9, he (predictability) could not hold the lead, allowing “The Torch” back into the match. With the score tied at 19, Vasquez hit two drive serves to the right that Fink was unable to return. 2010 3WallBall 3-Wall Big Ball singles champion Boxer Rosales has been a one-man wrecking crew as he has advanced through the largest singles draw of the tournament. Rosales has not dropped a game through four matches en route to the semifinals, including a two-game victory against X-Fest 3-Wall Big Ball singles champion Alfredo Morales. Rosales is joined in the 3-Wall Big Ball semifinals by WPH Outdoor #1 Juan Santos, Chava Cordova, and Edgar Vizcaino. JR WPH was proud to present an exciting junior handball clinic for more 16 youngsters competing in the 2016 3WallBall Outdoor Championships. WPH Coaches David Fink, Herman Mendez, and Lowveens Jacques led the juniors through serve and kill shot instruction, followed by alternating doubles points with the pros and an around-the-world rally game. The coaches stressed the importance of having fun, setting goals to improve, and the fundamentals of the game. Players were greeted by 30 mile per hour winds for the second consecutive day at the 2016 3WallBall Outdoor World Championships. The strong gusts subsided by mid afternoon, giving way to some of the best playing conditions in the seven-year history of the event. 2011 3-Wall Small Ball Singles champion Shorty Ruiz met first-time finalist David Fink in the Friday evening ESPN3 final. Fink had defeated Ruiz in their previous two 3-Wall Small Ball encounters at the 3WallBall Outdoor World Championships and would need a third consecutive victory to win his first Yellow Jersey. Ruiz started quickly in game one, building a 6-2 lead in game one with a dominating return of serve and fly kills. Ruiz kept Fink off balance for the remainder of the game, sealing a one-game lead, 15-5. Fink adjusted the Ruiz’s power return in game two, building an 8-4 lead and ultimately serving for the game at 14-8. Fink squandered three setups and six serves to win the game, while Ruiz seized the momentum to serve at match point, 15-14. Fink ended Ruiz’s seven-point run to serve for the game for the seventh time at 16-15, but was still unable to close out the game. Ruiz scored the final three points of the game to become the first two-time Small Ball 3WallBall singles champion. Morales and Fink teamed up for the first time at the 3WallBall Championships and clicked like a seasoned pair in game one of the final, controlling the rallies and the front court to take a one-game lead. Torres and Montijo applied more pressure in game two, adding zip to their overhand drives and making sensational retrieves to dominate the game and force a decider. Torres and Montijo continued to dominate in game three, building a 10-2 lead in the third game to 15. Team Torres/Montijo stood just two points from the title at 13-5 when Team Morales/Fink charged. With Morales playing perfect two-wall pinch out-the-door shots and Fink converting setups, Team Morales/Fink stood just one point from forcing overtime at 13-14. Team Torres/Montijo called a timeout, earned a quick side out, and when Fink shot from 30-feet, Montijo was there for the match-ending re kill. The top Big Ball WallBall stars advanced in the 1-Wall and 3-Wall Big Ball singles, setting up an exciting weekend of action on the Las Vegas Strip. Saturday will feature the Men’s and Women’s 1-Wall and 3-Wall Big Ball 3WallBall singles and doubles, with WallBall’s top stars aiming for their spots in Sunday’s finals. 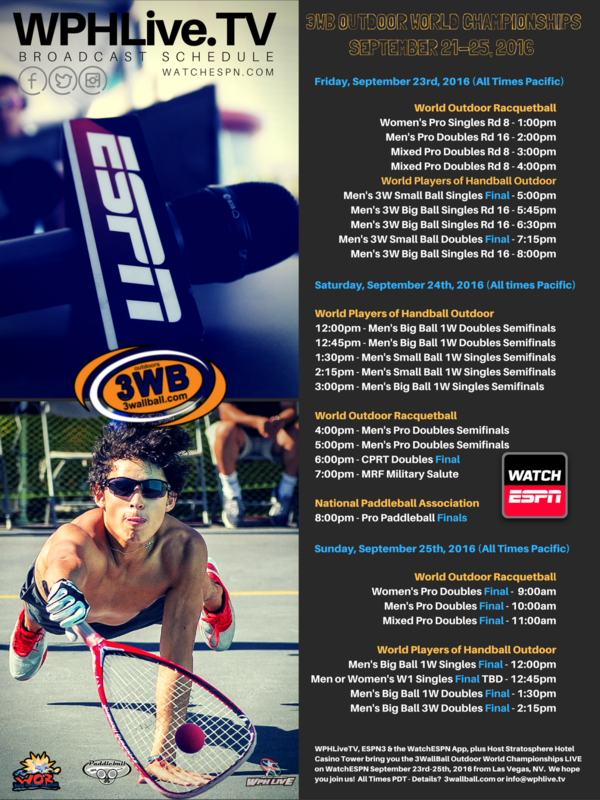 Watch LIVE on ESPN3 & www.watchespn.com beginning at 12pm Pacific time as the WPH turns to the 1 wall portion of the event and will feature semifinal action from 12p-4pm; meanwhile, the 3 wall big ball brackets continue with a live stream at www.wphlive.tv/live also at 12pm. 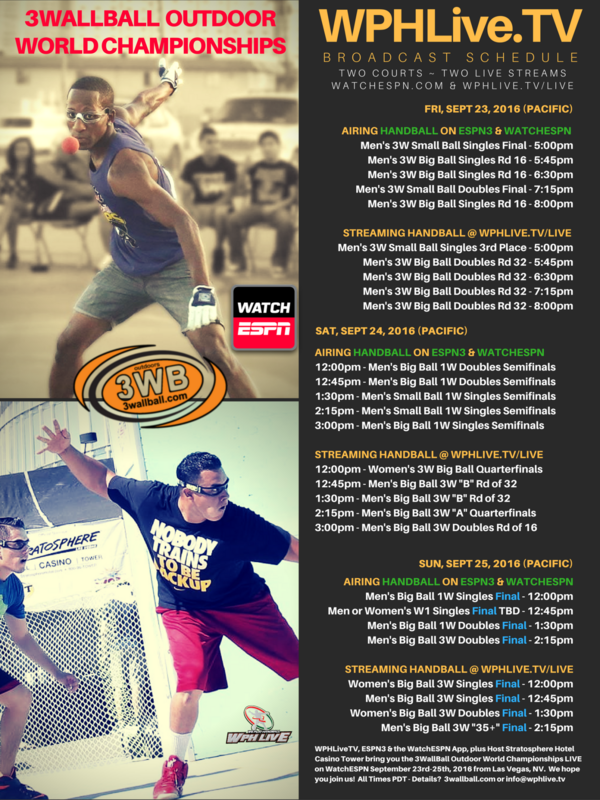 The first day of play at the 2016 3WallBall Outdoor World Championships featured Small Ball 3WallBall singles and doubles, with Race 4 Eight and WPH Outdoor stars in action. The Small Ball 3WallBall singles semifinals featured David Fink facing the Olympic Club’s Erik Torres and 2011 Small Ball 3WallBall champion Shorty Ruiz facing Tucson’s Abraham Montijo. Fink raced to a 14-6 first game lead in the upper bracket semifinal, only to watch Torres score nine straight points to serve for the game at 15-14. Fink reversed the momentum, scoring three consecutive points to escape with the first game. Torres continued his stellar play in game two, building an 8-5 lead. Fink rallied, scoring nine consecutive points to arrive at 14-8, and ultimately closed out the match 17-15, 15-10. Ruiz took control of the bottom bracket semifinal, leading 12-5 in game one and cruising with an array of high angled pinch shots and bottom board rollouts. Montijo charged back, scoring six consecutive points to cut the deficit to one. An easy Montijo fly kill error at 11-12 shifted the momentum back to Ruiz, who scored 18 of the final 19 points of the match to book his spot in the final. Friday will feature the Men’s Small Ball 3WallBall singles and doubles finals, as well as the start of the 1WallBall and 3WallBall Big Ball events. The opening night of the 2016 WPH 3WallBall Outdoor World Championships featured junior handball clinics for more than 50 Las Vegas high school students. JR WPH Coaches taught handball skills to the enthusiastic youngsters, focusing on the rules and proper techniques to play handball, while also having a lot of fun on the court! After learning the serve and hitting the ball off the bounce, the youngsters teamed up with one another and the pros to play King of the Court doubles, with the teams producing some incredible rallies. Thursday will feature the start of the men’s small ball, with the world’s best small ball 3WallBall players vying for one of outdoor handball’s most coveted prizes. Stay tuned to wphlive.tv for updates throughout the week!